Wine is like Sophia Loren. I made quite a few discoveries during my time with the Alto Adige tour this week. 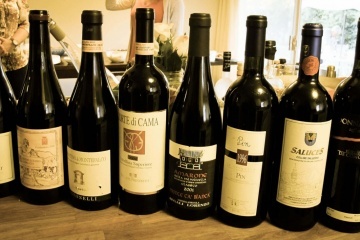 One of my favorite new producers is a co-operative winery in Bolzano called Cantina Bolzano. The winery has access to the grapes of over 200 tiny growers’ estates, ensuring they can select the very highest-quality fruit. The Pinot Grigio from Cantina Bolzano is bright, full of zippy acidity and a stunning minerality. The vineyards are perched almost 2,000 feet above sea level! I loved the aromatics as well- white flowers, a hint of metallic graphite and a lovely tone of citrus peel and apple skins. Cantina Bolzano’s Lagrein, Taber is also beautiful- full of that animal grit so typical of the varietal. The fruit is black and blue: really strong blackberry and blueberry with a touch of black currant. This wine is a beast! Grippy tannins, iron and meaty earthiness on the nose. This is a Lagrein to pair with your most serious meat dishes, speck, or a nice hot plate of Alto Adige’s famous bacon- filled dumplings. Who doesn’t like a bacon-filled dumpling? Who needs Champagne, when you have Alto Adige? Calling all Italian Wine Geeks, Portland!